What is the right Torch Booster for my studio? If you use a minor torch such as the Nortel Minor, Mega Minor, Cricket, Bobcat, Lynx, Piranha, Alpha, Cheetah, Scorpion or Mini CC then the TB-15 Torch Booster is the right system for you. If your plans include a larger torch in the future then consider a TB-30 or larger G-TEC system now. How does a Torch Booster work? TB-15 Torch Boosters connect to your low-pressure utility natural gas pipe and boost pressure to get the best performance from your torch. Most lamp working artists prefer fuel gas pressure at 5 - 10 psi but utility gas pressure is often less than 1 psi and the flame is weak. Turn the Torch Booster on when you begin work and off when you are done and that is all you need to do. 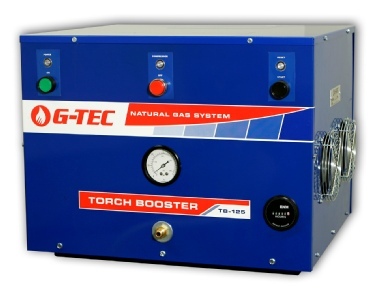 Torch Boosters automatically supply the right amount of natural gas - you don’t need to adjust or turn it off and on between tasks. 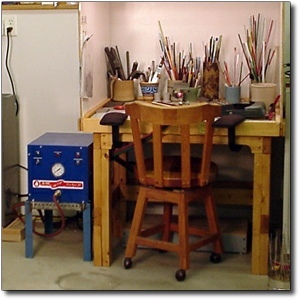 Torch Boosters are quiet and can be installed right next to your bench. TB-15 boosts utility natural gas to 25 psi then you use a regulator to lower pressure to exactly where you want it. Most torches are designed to work at 5 psi but with a TB-15 you can set pressure anywhere between 1 to 25 psi. How big is a TB-15 Torch Booster? TB-15 is compact; 12 “ wide, 12” tall and 16” deep and it weighs about 48 lbs. 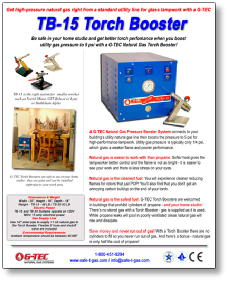 TB-15 Torch Booster uses 120V 15 amp electrical power and connects to a 1/2” low pressure utility natural gas pipe. If you use a mid sized torch such as the Nortel Mid-Range, GTT Sidewinder, Phantom, Bethlehem Barracuda, Bravo, Wildcat or similar torch then the TB-30 Torch Booster is the right system for you. If your plans include a larger torch in the future then consider a TB-60 or larger G-TEC system now. TB-30 Torch Boosters connect to your low-pressure utility natural gas pipe and boost pressure to get the best performance from your torch. Most lamp working artists prefer fuel gas pressure at 5 - 10 psi but utility gas pressure is often less than 1 psi and the flame is weak. 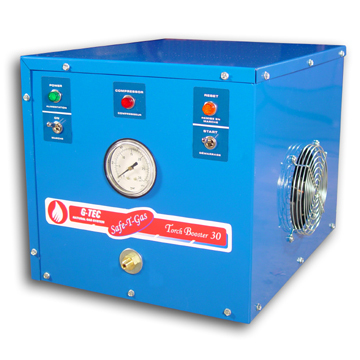 TB-30 boosts utility natural gas to 25 psi then you use a regulator to lower pressure to exactly where you want it. Most torches are designed to work at 5 psi but with a TB-15 you can set pressure anywhere between 1 to 25 psi. How big is a Torch Booster? TB-30 is compact; 12” wide, 12” tall and 16” deep and it weighs about 50 lbs. TB-30 Torch Booster uses 120V 15 amp electrical power and connects to a 1/2” utility natural gas pipe. If you use a major sized torch such as the Nortel Major, MidRange Plus, Phoenix, CC Bench Burner, GTT Phantom, Delta Elite, Mirage, Carlisle Hellcat or similar torch then the TB-60 Torch Booster is the right system for you. If you plan to use the Torch Booster in a classroom setting then TB-60 can operate 6 minor torches simultaneously. If your studio has more than 6 minor torches we have larger systems for you - call G-TEC at 1-800-451-8294 to discuss your requirements! More information about using high pressure natural gas in colleges, schools and similar environments. TB-60 Torch Boosters connect to your low-pressure utility natural gas pipe and boost pressure to get the best performance from your torch. Most lamp working artists prefer fuel gas pressure at 5 - 10 psi but utility gas pressure is often less than 1 psi and the flame is weak. 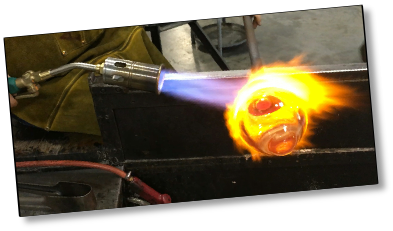 They boost utility natural gas to 25 psi, then you use a regulator to lower pressure to between 3 and 7 psi, which is the right pressure for most torches, although some artists prefer higher pressure with larger boro rods. TB-60 Torch Boosters are about the size of a window air conditioner-20 “ wide, 16” tall and 18” deep. TB-60 weighs about 90 lbs. TB-60 Torch Booster uses 120V 15 amp electrical power and connects to a 3/4” utility natural gas pipe. Click on our YouTube link to see and hear more about TB-15 and TB-30 Torch Boosters for glass lampworking. Get an overview of how the Torch Boosters works, how to turn the system on and off, how to install it, safety features and where to buy your Torch Booster. Is a Torch Booster quiet enough to use in your shop? The system is running during the entire video - look and hear for yourself! Is a Torch Booster quiet enough to use in your shop? The system is running during the entire video - look and see for yourself! If you use a large torch such as the GTT Delta Mag, Kobuki, Nortel Rocket, Red Max, Bethlehem Champion, Grand, Carlisle CC+ or similar sized torch then the TB-125 Torch Booster is the right system for you. If you plan to use the Torch Booster in a classroom setting then TB-125 can operate 12 minor torches simultaneously. If your studio has more than 12 minor torches we have larger systems - call G-TEC at 1-800-451-8294 to discuss your requirements! 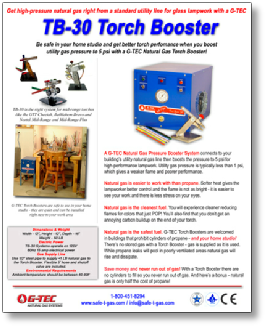 TB-125 Torch Booster is also the right system for a single air/natural gas torch used to keep glass while it is being shaped. TB-125 will support one air/gas torch. TB-125 Torch Boosters connect to your low-pressure utility natural gas pipe and boost pressure to get the best performance from your torch. Most lamp working artists prefer fuel gas pressure at 5 - 10 psi but utility gas pressure is often less than 1 psi and the flame is weak. They boost utility natural gas to 25 psi, then you use a regulator to lower pressure to the right setting for your torch. 20 “ wide, 16” tall and 18” deep. TB-125 weighs about 125 lbs. TB-125 Torch Booster uses 120V 20 amp electrical power and connects to a 1” utility natural gas pipe. A TB-500 Torch Booster provides high capacity/high flow for hot glass work. 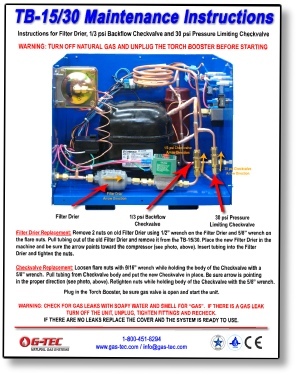 Scheduled Maintenance - Keeping your TB-15 and TB-30 Torch Booster in top condition is easy. We recommend changing the Filter Drier, Backflow Check Valve and Pressure Limiting Check Valve every 2,000 hours. Call G-TEC at 1-800-451-8294 to order a TB-15/TB-30 Maintenance Kit. Click on the YouTube link below to watch a short video showing how to install Maintenance Kit parts. and give you a hot flame on the torch. natural gas - you don’t need to adjust it during the day. regulator to lower pressure to the right setting for your torch. TB-250 and TB-500 Torch Boosters are 28 “ wide, 20” tall and 24” deep. TB-250 weighs 175 lbs; TB-500 weighs 285 lb. 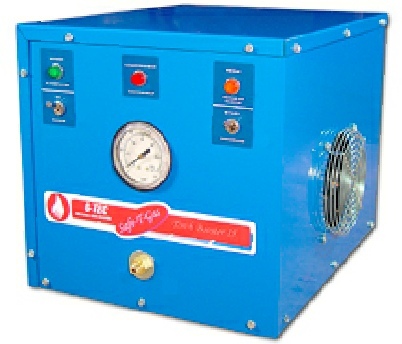 Both systems require 208V single phase 30 amp electrical service. Both systems require a 1 1/2” utility natural gas supply pipe.